Anyone remember these? Ahhh... the memories! Yes it/s good to see that they are still on the go.They should just make their 42nd official anniversary although they were actually running about on training runs this time in 1960. I fully remember the construction of the Depot at Hyndland and seeing these blue marvels with their white roofs as they were delivered from Linwood.In later years I worked with BR later of course ScotRail and was actively involved in the running of the Class 303s on their original North Electric services and on the Cathcart and later the Gourock line with their Class 311 additions. I/ll look out some photos through the ages and try and post them on the site. I would love to see any photos you have, as I definitely have a soft spot for these amazing beasts. Its a shame that most people now simply regard them as dirty, smelly trains, totally ignorant of the fact that they were responsible for a huge leap in Glasgow's transport system. Anyway, it seems that the prayers of the "white plastic" mob have been answered, as the nasty 334s have recently invaded the territory of the 303s. Now the drunken neds on the last Balloch will have something more upmarket to pee in, puke on, and throw their kerry oot at. The last 303 service, worked by 303011 and 303088 left Glasgow Queen St at 0927 on the 30th December. A huge crowd of enthusiasts, passengers, press and Scotrail employees boarded the express service to Helensburgh. They were given complimentary souvenir tickets, a postcard bearing a modern day picture equivalent to the Terence Cuneo painting "The blue train", and a wee dram of whisky. They gave an emotional last run, before heading back to Yoker to pan down for the very last time. They may be gone, but will never be forgotten. I'm really playing catch-up here, digging through all the old threads! old posts - I'm the hitherto Hidden Glasgow resident rail bore. I spent way too much time yesterday trawling every thread ever posted here! Fantastic stuff on here! You might find http://groups.yahoo.com/group/scot-rail or http://www.railpic.co.uk interesting! 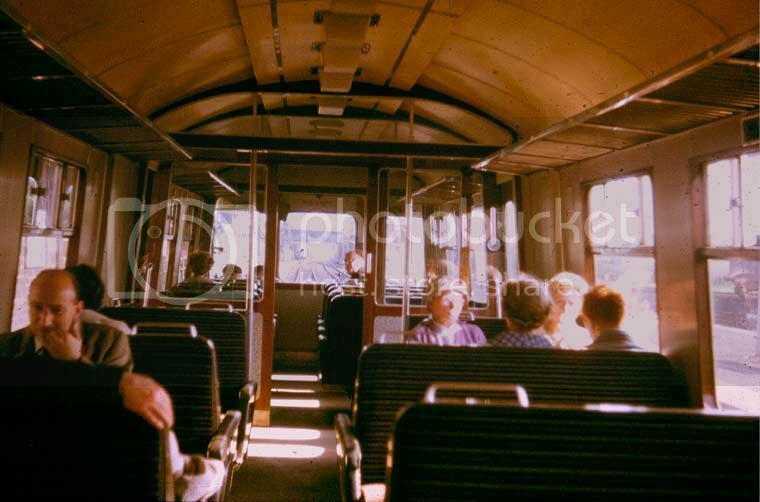 I remember getting these trains back from Balloch (when the level crossing was there) circa 1981 and sitting on those seats with shorts and sannies on....and being scared to sit back against the "furry" seat cos it would jag my sunburn.....ooooyaaahhh!!!!!! I presumed the driver would be there.. He sat on the left. You could always sit on the right. I vaguely remember travelling on a blue train once, though I was 6 or something at the time. AFAIK two are preserved, one at the Bo'Ness and Kinneil Railway (an original Class 303) and the other at Summerlee Heritage Museum in Coatbridge (a Class 311 built in Sheffield I believe, to supplement the 303s). It's a shame neither are still running. BTW Ian, I'm the same scotia47 who occaisionally posts inane drivel on the scot-rail group.